Sometimes, it is easy for us to say that we support a certain cause. Some plant a single tree and claim that they are environmentalists. But what does it really take to be an advocate for something? It’s simple - the one who walks the talk and not just quacks. Through the years, I’ve been a witness to how the people behind Autism Society Philippines Baguio Chapter, comprised mainly of parents and educators, engaged themselves with passion and dedication to create an environment that empowers individuals with autism spectrum disorder to be self-reliant, productive and socially accepted members of the community. They conduct innumerable activities to make this advocacy come into fruition and one of these is the Colors of ‘A’ Spectrum Photo Workshop hosted by the chapter annually by pooling together professional and hobbyist photographers to mentor children with autism. Inspired by Canon Ambassador and master photographer John Chua, who is at the forefront of Photography with a Difference, this photo workshop that started in 2009 has now become not just an avenue of showcasing the talents of children with autism but a family affair. In Baguio, this annual event is like a timeline of both ASP and Baguio Photographers growing together as one in pursuit for the love of photography and an avenue to exhibit the beauty of that lies within the City of Baguio and Benguet. Now on it’s seventh year, the 2015 Colors of ‘A’ Photo Exhibit following the workshop that took place at the Winaca Eco-Cultural Village formally opened at the Lower Basement of SM Baguio last 21 February 2015 with a ribbon-cutting ceremony led by ASP Chair Emeritus, Dang Koe, ASP advocate and exhibit director, Ompong Tan and the lovely couple, John and Harvey Chua. Obvious were the sense of accomplishment seen in the eyes of the participants and their families and fulfillment in their mentors. The photos in exhibit exemplify how the talents of these kids, now mostly in their teens, have evolved into masterpieces, honed by talented mentors through the years. The Colors of ‘A’ Spectrum Coffee Table Book is a compilation of photos taken by 43 participants with ages ranging from 5 to 27 years, exhibited at SM City Baguio from 2009 to 2014 – a six-year labor of love in the making. According to ASP Baguio Chapter president, Belette N. Vizcocho, this was a rather ambitious project with pure guts and the determination of all those who collaborated - from the gathering of materials, lay outing, getting sponsors to help finance the printing, which brought this project to fruition. 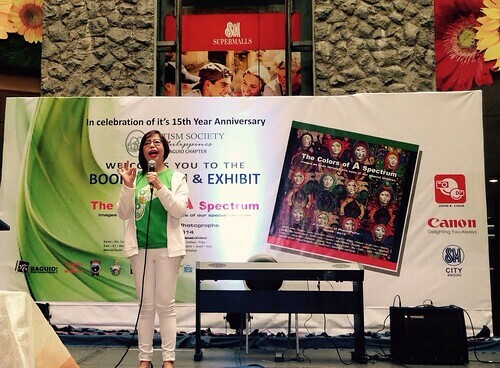 First launched in Manila on 31 January 2015 at The Podium Mall in Pasig, the Colors of ‘A’ Spectrum coffee table book had its Baguio Launch at the SM City Baguio Atrium on 21 February 2015 where guests of honor and speakers John Chua and Dang Koe challenged everyone involved to take this advocacy a notch higher by aiming to be able to send at least one individual with autism to compete and win in an international photography competition and to push the advocacy beyond education by bringing it to the workplace as a full proof of what understanding, acceptance and empowerment is all about. The young participants, who were the “superstars” of the event which marked the 15th Year Anniversary of ASP Baguio Chapter, happily obliged in the signing of the books! The Colors of ‘A’ Spectrum Coffee Table Book sells for P 2,100.00 (hardback) and P 1,900.00 (paperback) and is available at the locations outlined below. A mailing charge of P150.00 for delivery within the Philippines will be added to the cost of the book. The proceeds of the sale of the book will be used to subsidize continuing and future projects of the ASP Baguio Chapter. Buy on-line at www.facebook.com/ASP Baguio Chapter. About the contributor. Melanie Ku Marquez, a Colors of ‘A’ Spectrum Photo Mentor, is a mother, ultra runner, trail runner, duathlete, writer, columnist, photographer, traveller, graphic designer and entrepreneur.